Revenue rose 7% to $ 1,435 billion. In the Americas, net revenue grew 9%, or 10% on a constant currency basis. In Europe, revenue rose 3%, or 10% on a constant currency basis. In Asia, revenues climbed 8%, or 14% on a constant currency basis. Direct-to-consumer revenue increased 10%, due to a larger retail network and e-commerce growth. The company sees fiscal-year constant-currency net revenues growth in the mid-single digits. Management is also full-year capital expenditures of $ 190 million- $ 200 million and nearly 100 new company-operated store openings. "We delivered our sixth consecutive quarter of double-digit constant-currency revenue growth," said CEO Chip Bergh. "Growth was broad-based across all three regions and all channels, demonstrating that our strategies are working and our investments are paying off." Since 2011, Levi earnings have grown at a compound annual rate of 11.3% and net income. reached $ 285 million in fiscal 2018. Revenue has grown at a compound annual rate of 2.3% and hit $ 5.6 billion in 2018. The Americas made up 55% of sales, Europe made up 29%; and Asia, including the Mideast and Africa, contributed 16%. Shares rose 1.7% late after closing up 2.7% at 21.88 in the stock market today. Levi stock hit a high of 24.19 on April 1, but has been struggling to maintain its momentum. It has yet to form an IPO base. Levi stock performed above expectations when it went public, with shares jumping 32% on its first day of trading. Another indication of the demand was the IPO itself was oversubscribed and ended up pricing at $ 17 a share, above expectations. In addition to jeans, Levi makes casual and dress pants, tops, shorts, skirts, jackets, footwear and related accessories. Its brands include Dockers, Denizen and Signature. VF Corp . (VFC), which plans to spin off its jeans brands, slipped 1.3%. Jeans retailer American Eagle Outfitters (AEO) lost 2.5%. Baird analyst Matt Tingler said denim could be coming back into fashion at an opportune time for Levi stock. [19659004"Levi'sIPOshowsthatthedenimcategoryisafavorwithinvestorsandnotdeadasmanybelieveDenimhasbeenunderattackbyathleticclothingespeciallywomenhavingtransitionedtheirclothingawayfromdenim"hesaidlastmonth"Therearesignshoweverthatdenimisbeginningtoexperiencearesurgencecoincidentallyatthecostofathleticclothing"
Tingler also said there are good opportunities for the IPO stock if it can harness its brand in the lucrative Asian market. A strong presence there would boost Levi earnings. He also pointed out that strong performance for Levi could bode for other established names that have fallen out of favor. "A resurgence in Levi's will also be an indication of consumers interest in heritage brands. 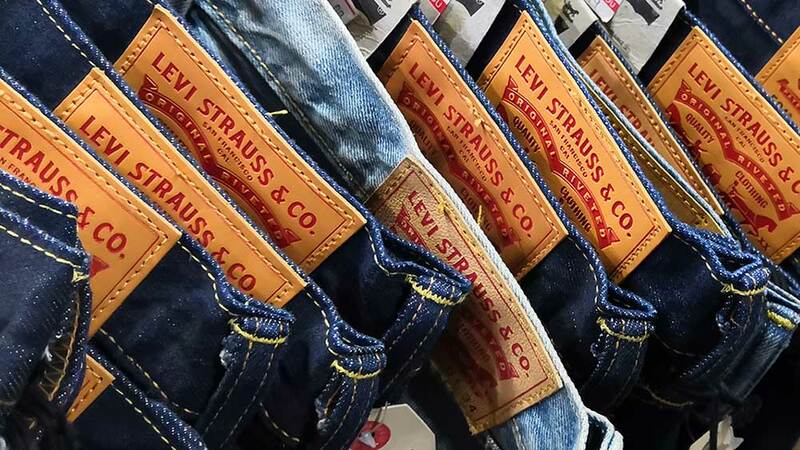 Levi's, much like Champion, which has seen exceptionally strong growth, had fallen out of favor for newer, more modern brands like Paige, Citizens for Humanity, Fidelity and other denim brands over recent years, "he said.